This constitutes an agreement between the Board of Regents of Washington State University, hereinafter referred to as the UNIVERSITY or EMPLOYER, and the Washington State University Police Guild, hereinafter referred to as the GUILD. The provisions of this agreement apply to those classified staff and employees employed at Washington State University in Bargaining Unit 4 as set forth in Article 4.1. The Guild is recognized as the exclusive representative for all those employees working in job classifications listed in Article 4.1. The parties agree that it has been and will be in their mutual interest and purpose to promote systematic and effective employee-management cooperation; to promote fair and reasonable working conditions; to promote effective methods for prompt adjustment of differences; to promote efficiency and economy of the University’s operations; and to provide meaningful collective negotiations of matters subject to collective bargaining under RCW 41.80. Day(s) – Unless otherwise specified in this Agreement, day(s) shall be calendar day(s). Domestic partner – A person who is neither married nor related by blood to the employee, is the employee’s sole domestic partner, lives together with the employee in the same residence and intends to do so indefinitely, is along with the Employee at least eighteen years of age and at least one of the persons is sixty-two years of age or older and is responsible with the employee for the other’s welfare as defined in RCW 26.60.030. Family member – Individuals considered to be members of the family are mother, father, sister, brother, mother-in-law, father-in-law, spouse/domestic partner, grandparent, grandchild, son, daughter, stepchild, a child in the custody of and residing in the home of an employee. 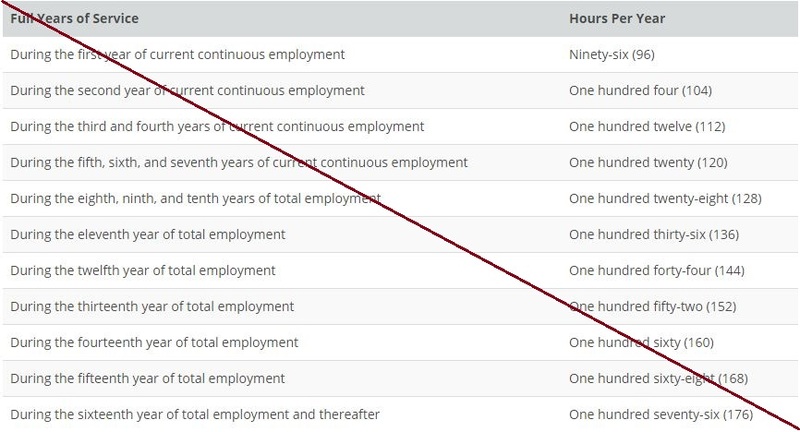 Full-time employees – Employees who are scheduled to work forty (40) hours per week. Seniority – Continuous, unbroken service within classification at the police department at Washington State University starting with the most recent date of hire, except for layoff and recall purposes where University seniority will apply. The Agreement expressed herein in writing constitutes the entire agreement between the parties and no oral statement shall add to or supersede any of its provisions. A. Except as provided in the Savings Clause, the University and the Guild for the duration of the Agreement each voluntarily and unqualifiedly agrees to waive its right to oblige the other party to engage in collective bargaining with respect to any subject whether or not it is specifically referred to or covered in this Agreement. B. This Agreement preempts all rules, and subjects addressed in whole or in part by rules adopted or administered by the Washington State Human Resources Office. Unless superseded by a specific provision of this Agreement, the University’s Policies, Rules, Regulations, and Procedures, as currently written or as amended, will apply to all employees. P. Suspend, demote, reduce pay, discharge, and/or take other disciplinary actions. Should the University request, but not receive anticipated appropriations or revenues, those portion(s) of the Agreement that are contingent upon financial resources will be opened for renegotiation. The parties agree they may re-open negotiations on compensation adjustments dependent upon economic feasibility. Indicators of economic feasibility will be: the Director determines implementation of such adjustments is economically feasible and the legislature appropriates funding in accordance with applicable law; if a State initiative or referendum is submitted to the voters and is passed that specifically provides funding for general salary increases for higher education employees; or the University provides across the board salary increases to Civil Service and/or Administrative Professional employees. If tentative agreement is achieved, the University will submit a request to OFM for a finding of financial feasibility and, if such a finding is made, for approval and funding by the Governor and Legislature when necessary. On behalf of employees in the bargaining unit, the Guild and employees agree that they will not participate in, cause, instigate, support or condone any work stoppage, strike, slowdown or other inference with the normal operation of the University. A. To the extent that provisions in the Agreement are in conflict with applicable law, the law shall prevail. Should any article, section or portion of the Agreement be held unlawful or invalid by a court or held to be in conflict with applicable law by a court of competent jurisdiction, such decision shall apply only to the specific section, article or portion thereof. The remaining parts or provisions shall remain in full force and effect. The parties agree to negotiate immediately and substitute for the invalidated article, section or portion thereof. B. If any Police Department policies or procedures are in conflict with this Agreement, the Agreement shall prevail. Copies of Department Policies and Procedures shall be made available to officers. It is agreed by the University and the Guild that the University and the Guild are legally obligated to insure non-discrimination in all terms and conditions of employment; and will provide equality of opportunity, consideration and treatment for all employees. Neither the University nor the Guild shall interfere with the rights of employees covered by this agreement to become or refrain from becoming members of the Guild, and neither shall discriminate against any such employees because of membership or non-membership in any employee organization. This section is not meant to diminish employees’ rights to petition for an agency shop in accordance with PERC rules and regulations. A. The Guild and the University agree that no employee should work, or be directed to work, in a manner or condition that does not at least comply with minimum accepted safety practices or standards as established by the Washington Industrial Safety and Health Act. B. When an employee has reason to believe that an unsafe working condition exists, the employee shall immediately report the condition to the Supervisor. C. Attendance at the Public Safety Division Safety Committee meeting shall be in compliance with the University safety rules but shall in no case result in overtime. D. No member of the bargaining unit shall work in excess of twelve (12) hours per day unless it is an emergency situation as determined by the Police Chief or other command personnel or agreed upon by both parties. E. The University will comply with the University Blood Borne Pathogen Program as administered by Environmental Health and Safety. The University agrees that its program shall, at a minimum, meet standards set by State and Federal laws, and/or administrative codes. F. It is understood that safety will be considered when developing departmental policies and procedures. A. Law enforcement is a career that requires participants to devote their full energies to the work and lifestyle that is found therein. While economic or diversified interests may compel other activities for pay or experience, it is expected that the overriding loyalty of each employee will remain with the Washington State University Police Department. So that each employee is aware of what the Department perceives as proper perspective for relating career endeavors to off- duty work or related activities, the following guidelines have been established. 5. Creates a potential conflict of interest with department operations. C. If an off-duty employment situation is held by a member of this bargaining unit and later found to violate any provision stated in 3.2.B above, the employee will be required to terminate such employment/service. D. Employees directed to report for work will do so regardless of their off duty employment situation. E. Employees shall notify the Chief of any outside employment. A. Lunch and breaks may be taken anywhere within the Pullman city limits. B. Officers can purchase food only at those commercial establishments whose primary business is the preparation and or the sale of food; meals at taverns, cocktail lounges, bars, or their functional equivalents are prohibited. C. Off campus lunch breaks are subject to the approval of the officer’s supervisor, and dispatch is to be notified prior to taking breaks off campus. A. Employees in the bargaining unit are covered by the provisions of the State’s Tort Claims Act (Chapter 4.92 RCW). Pursuant to the Tort Claims Act, the State provides legal defense for any employee against whom a claim for damages is made which arises out of the employee’s good faith performance of his or her job duties. The final determination of whether an employee meets the criteria for providing defense rests with the Attorney General’s Office and the WSU Board of Regents. Any and every judgment obtained in cases in which the Attorney General’s Office defends the employee is paid from State funds. A. When the University hires or promotes an employee into a classification represented by the Guild, the University will notify the employee of his or her obligation under an agency shop. B. Employees who choose not to become Guild members must pay to the Guild, no later than the thirtieth (30th) day following the beginning of employment, an agency shop fee equal to the amount required to be a member in good standing of the Guild. Guild that are equal to its membership dues, less monthly Guild insurance premiums, if any. These payments will be used for purposes within the program of the Guild that are in harmony with the employee’s conscience. Such employees will not be members of the Guild, but are entitled to all of the representational rights of union members. D. The Guild will establish a procedure that any employee who makes a request may pay a representation fee equal to a pro rata share of collective bargaining expenses, rather than the full membership fee. E. The University will notify new employees of the above provisions. If an employee fails to meet these conditions, the Guild will notify the University and inform the employee that his or her employment may be discharged. During the term of this Agreement, the University shall deduct current Guild dues from the pay of each member of the Guild upon written authorization. Authorization forms will be provided by the Guild. When filed with the University, the authorization form will be honored in accordance with its terms. In order to cancel the payroll deduction, the employee shall file written notice with the University and the Guild thirty (30) days prior to the effective date of the cancellation. Deductions will be transmitted monthly to the Guild electronically or by check payable to its order. Upon electronic deposit or issuance and transmission of a check to the Guild, the University’s responsibility shall cease. The Guild agrees to provide 30 days written notice of any changes in dues. The University shall be held harmless by the Guild with respect to any actions it may take to comply with this section, and the Guild shall indemnify and defend the University from any claims arising there from. Upon effective date of this Agreement, the University will supply to the Guild a roster of employees in the bargaining unit. The list will include names and job classifications. The University will provide a list of new hires upon the request of the Guild, but such requests shall be made no more than once a month. The University agrees to provide a three-foot by four-foot bulletin board in the Police Department Building for use by the Guild. A. One (1) duly authorized Guild Representative may participate in the grievance process as outlined in Article 11 without loss of pay if the grievance process occurs during that Representative’s normal working hours. In no event shall any Guild representatives be eligible for or be entitled to overtime for participating in the grievance process. The University agrees that subject to Washington State Executive Ethics Board statutes, rules, policies and declaratory rulings, the Guild may have limited use of University facilities as long as there is no cost to WSU. Such use shall not interfere in any manner with the University’s operations.Upon effective date of this Agreement, the University will supply to the Guild a roster of employees in the bargaining unit. The list will include names and job classifications. The University will provide a list of new hires upon the request of the Guild, but such requests shall be made no more than once a month. B. Any person who performs services under the direction or on behalf of the Guild in accordance with this Agreement, or who serves on a Guild committee, shall not be discriminated against because of their Guild activities. C. One (1) authorized Guild representative may be granted leave without pay for a reasonable period of time for the purpose of attending Guild conferences and meetings, as determined by the Police Chief; provided that the authorized representative’s absence will not adversely affect the University’s operations nor cause the University to incur overtime or other additional expenses. Notice of intent to be absent for such purposes shall be given the University in sufficient time to enable it to secure someone to perform the employee’s duties without incurring overtime. The Guild agrees to assist, upon request, in arranging for a replacement when necessary in order to prevent overtime from occurring. A. Recognition: The University recognizes the right of the Guild to designate a maximum of three (3) Guild representatives who shall be members of the bargaining unit and who upon proper designation in accordance with section 4.6.C of this Article shall be authorized to take up employee grievances through the grievance procedure of this Agreement. No more than one (1) Guild representative will be involved in processing an individual grievance. All such representatives shall be able to bargain successor contracts, however, any paid release time for such bargaining must be agreed to by the University prior to the start of bargaining. B. Guild representative Release Time: A Guild representative who is processing a grievance in accordance with the grievance procedure of this Agreement shall be permitted reasonable time to assist in the resolution of legitimate employee grievances on the University’s property without loss of pay or recorded work time. Time off for processing grievances shall be granted to a Guild representative by management following a request, but in consideration of job responsibilities. If permission for time off is not granted, the supervisor shall arrange for time off at the earliest possible time thereafter. C. Designation of Guild representatives: On a yearly basis, the Guild will submit the names of all Guild representatives to the University’s Labor Relations Officer and Police Chief. The Guild will notify the Labor Relations Officer and Chief in writing of any changes in Guild representatives as soon as practical after the change is made. 5.1 The purpose of this Article is to establish an orderly procedure for discussion and disposition of matters affecting working conditions of employees covered by this Agreement. A. The University agrees to notify the Guild and the President of the Guild reasonably in advance of anticipated University actions that broadly affect working conditions of employees covered by this Agreement, and a meeting shall be held thereon if requested by the Guild. Reassignments and emergency actions shall be excepted from the advance notice requirements of this provision. B. There shall be a Guild-Management Committee consisting of three (3) members designated by the Guild and three (3) members designated by the Vice President for Finance & Administration. One (1) of the members designated by the Vice President for Finance & Administration shall preside as Chairperson. Appropriate resource persons may be in attendance as required and agreed upon by both parties. C. Summary minutes will be taken by a person designated by the Chairperson. Such minutes shall not alter the terms and conditions of this agreement. The minutes shall consist of the topics discussed and the disposition of each. Copies of the minutes shall be reviewed and signed jointly by a University designee and member designated by the Guild who participated in the meeting, before such become official and are distributed. Copies of officially approved minutes shall be furnished to each member of the Committee. D. The Guild-Management Committee shall meet quarterly or more frequently as mutually agreed. The Committee shall have no bargaining authority; however, matters agreed upon shall be supported by both the University and the Guild. Nothing in this Article shall be construed to obligate either party to limit, restrict, or reduce their prerogatives as outlined in this agreement. It is agreed and understood that the labor management meeting process is designed to facilitate employer/employee cooperation. The parties recognize that discussion of changes will be conducted prior to the implementation of such changes. These discussions should allow full consideration of concerns of both parties. The parties should make a good faith effort to reach agreement on the proposed changes prior to implementation. However, after giving due consideration to the concerns and suggestions of the employees, management should be able to implement changes in training programs, personnel practices or policies as needed without bargaining those changes to impasse. E. Employees who are representing the Guild at the Guild-Management Committee meeting shall be in pay status for actual time spent at meetings held during their regularly scheduled shift. Attendance shall in no case result in overtime compensation. F. Items for the agenda for the Guild-Management Committee meetings shall be submitted to the designated Police Department personnel not less than five working days prior to the meeting. The agenda may be supplemented by either party and a final agenda shall be furnished to both parties not less than one working day prior to the meeting. The agenda shall consist of issues that are of general concern only and will exclude any individual grievances in process. 6.1 Employees of this bargaining unit shall work a scheduled seven (7) day work period unless assigned to a twelve (12) hour day, fourteen (14) day work period. The fourteen (14) day work period shall be in accordance with Section 7(k) of the Fair Labor Standards Act. There shall be no less than two officers on duty at any time, including any non-Guild, WSU Police Department commissioned officer so long as the department makes a good faith effort to find an off-duty officer willing to fill the vacancy, or in situations where an officer is only off duty for a short period of time. events, training and special assignments may necessitate changes in work schedules and/or work hours. B. The twelve (12) hour day is to be used with the fourteen (14) day work period. The fourteen (14) day work period schedule shall be composed of three (3) days worked, three (3) days off, four (4) days worked, four (4) days off. There will be two (2) shifts, Day and Night. Each shift will be composed of two (2) squads, for a total of four (4) squads, A, B, C, & D.
C. Inclusive in the eight (8) hour or ten (10) hour day will be a thirty (30) minute paid lunch and two fifteen (15) minute breaks for all employees. Inclusive in the twelve (12) hour day will be a thirty (30) minute paid lunch and three ten (10) minute breaks for all employees. It is understood that employees will respond to service needs during lunch and breaks. 6.4 The Employer will establish and maintain a continuous twelve-month work schedule. Any changes to the schedule shall be by mutual agreement between the employee and the Employer: provided, however, that to accommodate operational convenience or necessity, the Employer may change the schedule for one or more employees upon seven (7) days prior written notice. In the event of illness, emergency, or any other unforeseen circumstance, the employee may be required to adjust his or her schedule to complement operational necessity of the Department with less than seven (7) days notice. In the event a unilateral change is made by the Employer because of operational convenience or necessity, the Employer will compensate the employee for extra hours worked in the work week in which the change is made in accordance with this Agreement. No employee shall be required to work more than five (5) consecutive days for a five (5) day eight (8) hour shift or four (4) consecutive days for a four (4) day ten (10) hour shift or a twelve (12) hour/day shift in accordance with Article 6.3. The University must allow at least two (2) consecutive days off without charge to the employee’s leave banks, unless agreed upon by both parties. 6.5 The rotation of employees assigned to Patrol Section shall occur on the last Friday of August for Fall Semester, the first Friday of January for Spring Semester and the last Friday of April for Summer Semester. Annual rotation shall begin on the last Friday of August. No employee shall be required to work more than five (5) consecutive days during the shift rotation period. The University must allow at least two (2) consecutive days off without charge to the employee’s leave banks, unless agreed upon by both parties. 6.6 Shifts and individual positions therein, shall be bid upon by the employees according to seniority as defined within this agreement. The schedule shall be maintained and posted by the Patrol Sergeants. Shifts shall be posted two full rotations in advance and will not be changed, except as allowed in 6.2 above. A. Sergeants and Corporals on each respective shift shall bid opposite days off to minimize overlapping work days, unless operations necessitate otherwise. 6.7 Shift preference, changes and trading in shift assignment may be granted to any employee who has requested, in writing, special consideration for their circumstances. Written requests shall be approved or disapproved by the Employer. In the event that two employees wish to trade shifts, both employees must submit written requests for consideration. Approval of such requests shall consider adequate shift coverage in addition to the employees’ desires. Patrol employees are expected to work one rotation of each shift every two (2) years. A. Shift coverage will not be jeopardized to a level that compromises the safety of others. B. The employee has met the requirements of 6.6. 6.9 Any employee who is called back to work once he or she has left the campus and outside of his or her normally scheduled shift shall receive a minimum of two (2) hours bonus pay plus time actually worked. The bonus pay shall be compensated at the regular rate; time worked shall be compensated at the rate of time and one-half. This section shall not apply to a shift holdover for unanticipated work at the conclusion of the officer’s normal shift. An employee on Standby status called to return to work does not qualify for Callback pay. 6.10 For employees covered under this Agreement, the seven-day week shall begin at 2100 hours Thursday and end at 2059 hours the following Thursday. The fourteen (14) day work week shall begin at 2100 hours Thursday and end at 2059 hours the second Thursday from that date. 6.11 Employees who work more than their regularly scheduled day may request the extra hours off during that workweek. Such requests may be approved/disapproved consistent with operating requirements at the sole discretion of the Police Chief. 6.12 Overtime: Overtime shall be paid at the rate of one and one half (1 ½) times the employee’s regular rate of pay for any time worked in excess of their regularly scheduled work shift or work period. Overtime shall be earned at a minimum of three (3) hours pay for each prescheduled outside funding overtime assignment that is cancelled after the officer has arrived at the work location. 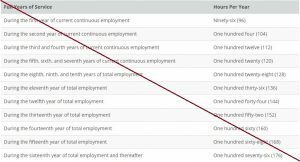 For the purposes of computing overtime, time off in pay status shall be considered as time worked. 6.13 Compensatory time shall be earned at a rate of one and one half hours for each hour of work for which overtime compensation is required. Employees shall be offered the choice of either payment by cash or compensatory time for overtime compensation, except service center overtime shall be paid in cash only. Employees will normally be allowed to take off such accrued compensatory time when requested unless the time off would unduly disrupt Department operations as determined by the Police Chief or designee. Accumulated compensatory time for each employee shall not exceed two hundred forty (240) hours. Any additional overtime must be paid in cash. All employees shall deplete all of their accrued compensatory time prior to the end of each biennium, or shall be paid for the unused portion. Accrued compensatory time may be cashed in at the employees’ discretion. 6.14 Management shall attempt to distribute pre-scheduled overtime equally and fairly, consistent with operating requirements and in consideration of individual employee desires. 6.15 Schedules for rest periods and meal breaks shall be as approved by the Shift Supervisor. 6.16 When two (2) or more officers are on duty, a minimum of one officer shall remain on active duty status during rest and meal break periods. 6.17 Days off shall be consecutive unless mutually agreed upon by the employee and the employer. 6.18 Employees shall be provided a minimum of ten (10) hours off between scheduled shifts and training, unless a shorter time is agreed upon by both parties. 6.19 Officers shall receive expense reimbursement on the same basis as other University employees and in accordance with the policies of the Office of Financial Management. A. The Court/Student Conduct hearing assignment is contiguous with the officer’s regularly scheduled shift, starting or ending. When the assignment is contiguous with the officer’s regularly scheduled shift, the officer shall receive the applicable rate for all hours of the required assignment with no minimum. B. The Court/Student Conduct hearing assignment falls during the officer’s regularly scheduled shift. When the assignment falls during the officer’s regularly scheduled shift, the assignment shall be considered part of the regular workday. A. The probationary period shall be utilized to provide an adequate job orientation to include regular discussions of performance as each set of position duties may require. B. The Chief will provide each employee a copy of the position description and a copy of the performance evaluation form. C. Entry level employment is subject to a probationary period of twelve (12) months actual service from the date of graduation from basic academy training. Lateral entry employment and promotions are subject to a probationary period of twelve (12) months from the date of appointment. Actual service shall not include time spent away from the department for more than fifteen (15) work days during the period. Termination of a newly hired probationary employee or reversion of an officer during a probationary promotional appointment may be for any reason and is not subject to the grievance process under Article 11. Probationary periods for individual officers may be extended at the discretion of management. Upon hiring, the University may start an employee at a higher step than the minimum. D. Probationary Employees shall be provided all necessary uniforms and equipment as soon as practical. A. The University may appoint a Campus Police Officer on a temporary basis to fulfill an immediate staffing need while an employee is on extended leave, for a predetermined time-limited duration. The recruitment and offer letter will notify the applicant that the position is a temporary position and its expected end date. B. It is recognized that the extension or renewal of the appointment is dependent on satisfactory performance, the need for extension, to fulfill the department staffing needs, to complete the project and/or if additional funding is secured to extend the appointment. The conclusion of a temporary appointment will not result in a layoff of the employee. C. During the course of employment the temporary Officer will be recognized as a WSU Police Guild member and afforded all the rights of such membership. D. The determination as to whether or not the temporary Officer will need to be sent to the Washington State Criminal Justice Basic Law Enforcement Officer Academy and/or the two (2) week Equivalency Academy for certification will be made based on the Officer’s qualifications and length of appointment. E. The temporary Officer will undergo field training orientation (FTO). The FTO period will be dependent on the temporary Officer’s unique knowledge, skills and abilities. A. Temporary Upgrade will be handled on a case-by-case basis. 1. Extended Temporary Upgrades: The University may assign an employee the duties and responsibilities of a higher-level class for a period of up to three (3) full shift rotations or twelve (12) months. B. During the temporary upgrade the employee will be placed at either the starting step of the new range or the step which provides a minimum of a two (2) step increase, whichever is higher, not to exceed the highest step of the new range. C. The employee forfeits their right to audit the position during the period of the temporary upgrade. The employee will return to their former classification and appropriate rate of pay after the period of temporary upgrade. D. University may use rotating assignments for the purpose of employee development or operational necessity. A. Seniority, for these purposes, is defined as the continuous, unbroken service within the Police department at Washington State University, starting with the employee’s most recent date of hire. B. The University will layoff temporary appointment or probationary status bargaining employees prior to implementing a layoff of a permanent employee. C. Employees will be laid off in inverse order of seniority. In the classification to be laid off, the least senior permanent employee shall be the first laid off. D. Employees shall be provided fifteen (15) days notice of any layoff. A. Continued employment in a vacant lateral or lower bargaining unit classification in which the employee has held permanent status at the time of the layoff. B. If no vacant funded position is available, the next option is to a position occupied by the employee with the least seniority. C. The employee may be offered a vacant lateral or lower classification bargaining unit position. The employee is not required to have held permanent status in the class, so long as they have the minimum qualifications to perform those duties. Objective: The performance evaluation process gives the Chief and other command personnel an opportunity to discuss performance goals and expectations with their employees, assess and review their performance with regard to those goals and expectations, and provide support to employees in their professional development, so that skills and abilities can be aligned with agency requirements. A. The Chief and other command personnel are responsible for all aspects of the evaluation. Sergeants will provide written documentation for Performance Evaluations whenever directed to do so by the Chief or other command personnel. 1. Employee work performance will be evaluated during probationary and trial service periods and at least annually thereafter. The Chief and other command personnel in coordination with the immediate supervisors will meet with employees at the start of their review period to discuss performance goals and expectations. Employees will receive copies of their performance goals and expectations as well as notification of any modifications made during the review period. 2. The performance evaluation process will include, but not be limited to, a written performance evaluation on forms used by the Chief or other command personnel, the employee’s signature acknowledging receipt of the forms, and any comments by the employee. A copy of the performance evaluation will be provided to the employee at the time of the review. If the need arises, the reviewer (typically the second line supervisor) may function as a mediator upon the request of either the supervisor or the employee. The employee has the right to submit a written rebuttal to the content of the evaluation. The original performance evaluation forms, including the employee’s comments, will be maintained in the employee’s personnel file. 3. The evaluation process is not subject to the grievance procedure. A. There shall be only one official personnel file for each employee, which shall be maintained in the Human Resource Services (HRS). The employee and/or his or her representative may examine the employee’s personnel file if the employee has so authorized in writing during regular working hours. Such examination shall be done under the supervision of the records custodian. B. If any derogatory material is placed in the employee’s official personnel file, a copy will be furnished to the employee. The employee will have the right to rebut the material and have that answer attached to the file copy. C. The incumbent employee upon request may review personnel files other than the official file. D. The University shall not permit access to or the release of personnel records or personally identifiable information to non-University entities without notification to the employee. Such examinations shall be by request to the Public Record Officer and will only be released as required by law. 8.1 All commissioned officers will be required to wear the official department uniform except when directed otherwise by proper authority. 8.2 The Employer shall furnish all required uniforms and footwear for commissioned officers as specified by the Employer, and agrees to replace used uniforms as needed. All uniforms will be used only for the work of the Employer and shall remain the property of the Employer, but they shall be properly maintained by the employee provided the approved uniform is of wash and wear variety and not wool or other fabrics requiring dry cleaning. If non-wash and wear uniforms are the approved uniform, the University shall provide dry cleaning. The University shall provide a $500 footwear reimbursement and/or allowance for each bargaining unit member during this Contract term. 8.3 Approved Uniforms: The following uniforms are approved for wear on patrol at any time. Officers will be issued one (1) Dress Uniform and one (1) Winter/Cold Weather uniforms. Officers shall have their choice of wearing any of the Everyday Uniforms for duty. They will be issued their choice of two (2) Everyday Uniforms. Officers qualified for bike patrol will receive two (2) sets of the bike uniforms. Midnight Navy or Black shall be the color of all 5.11 uniforms. Uniforms shall be replaced by the employer as needed. Department Issue Class A as set by policy. 8.6 Officers having any item of clothing damaged or stolen on duty will have the item cleaned, repaired or replaced at the Employer’s expense on approval of the Chief of Police as reasonable and necessary. Employees who have had uniforms or clothing contaminated by bodily fluids during the course of duty may have the uniform cleaned at the Employer’s expense. Personal property items authorized for use on the job by the Employer that are damaged while being used on duty will be repaired or replaced at the Employer’s expense subject to prior approval by the Police Chief. Employees shall be held accountable for all uniforms, weapons and leather/nylon gear which are issued to the employees by the Employer. Items issued by the Employer which become worn out, lost or destroyed as a direct result of the performance of the employee’s duties, or as a result of an occurrence not due to the employee’s intentional act or negligence, shall be replaced by the Employer. 8.7 The Employer shall furnish specialized equipment as determined by the Employer. The Employer shall repair or replace items of departmental equipment rendered unserviceable in the conduct of duty. 8.8 Policies and procedures regarding uniform and adherence to standards for uniforms are set forth in the Departmental Policies. 8.9 The Employer will provide the following accessory items: color brass, name plate, shoulder patches, sleeve stripes, shooter badges, uniform badges, hat badges, and ammunition. All accessory items shall remain the property of the Employer but shall be properly maintained by the employee. 8.10 Pistols issued to commissioned officers provided by the Employer will be inspected by a certified factory authorized Glock Armor at least every year and replaced as determined by this authorized Glock Armor. 8.11 Ammunition will be furnished by the Employer and will be replaced at a minimum of once per year. 8.12 Input into the style and uniform specifications shall be sought from the Guild but the Employer reserves the right to make the final decision. 9.1 The University and the Guild recognize the importance of training programs in the development of the employees in the bargaining unit. 9.2The University will make every reasonable effort to continue existing training programs and to develop new programs. Employees will be encouraged to participate in and provide training. 9.3 The Guild-Management Committee shall meet to discuss training standards for all employees within the bargaining unit. If the Committee is not able to reach agreement with the University regarding a training schedule within one year from the effective date of the agreement, the contract shall be opened by notice for discussion of this article and this article only. 9.4 Special arrangements as determined by the University will be made for swing and graveyard employees to attend schools. Adjusted travel days may be provided as determined by the University so as to avoid the loss of normal days off which fall within the scheduled training or travel to and from so long as this adjustment does not interfere with work productivity and efficiency. 9.6 The University shall provide an opportunity for each employee, who has been employed as a WSU police officer for six (6) years or more, to participate in a professional development course of up to forty-eight (48) hours per Contract period. The professional development course should be aimed at enhancing the knowledge, skills, as well as the professional growth of the bargaining unit member. The training request will be reviewed and based on operational necessity approved or denied at the Chief’s discretion. Should the employee not be allowed to participate in their primary choice for training, the Chief will approve another course, which provides professional development to the individual employee. 10.1 Discipline imposed by the University against any employee shall be for just cause. 10.2 If the University determines to bring disciplinary action against an employee for any reason, the employee shall be apprised of his or her rights of notice, representation, and grievance rights as set forth in this Agreement. 10.4 Prior to the imposition of any disciplinary action, the employee shall be notified in writing of the alleged violation and the action being contemplated by the University. The employee will be given reasonable opportunity to respond and may be represented. 10.5 The University may place an employee on paid assignment as outlined in 10.11.Q pending the final decision as to the appropriate discipline resulting from the pre-disciplinary meeting. 10.7 Corrective action is not grievable beyond Step 3 in the grievance procedure. 10.8 Disciplinary action must be taken by an appointing authority. Supervisors and above may impose corrective action. 10.9 The employee and the Guild representative with the employee’s authorization shall have the right to inspect the full contents of his or her personnel file. No corrective or disciplinary documentation may be placed in the personnel file without the employee having first been notified of said complaint and given a copy. An employee shall have the opportunity to present a written rebuttal to be inserted in his or her personnel file. Disciplinary material shall be removed from the personnel file upon mutual agreement between the employee and the supervisor. The employee shall be required to sign the corrective action or disciplinary action acknowledging that he or she has read the contents of the document. 3. The employee submits a written request for its removal. If there is a new incident resulting in discipline within the applicable retention period, the documentation shall not be removed from the employee’s personnel file until the expiration of an additional like period. The University has the right to retain corrective action and disciplinary action documentation in the personnel file and ancillary files should the action(s) in question be deemed as egregious in nature; a violation of state or federal law, or for other such good reason. As officers are entrusted and charged with the responsibility and duty to protect and serve society, it is essential that they command the respect of those whom they seek to protect. This public trust requires that officers demonstrate the highest degree of character and integrity. It is with this heavy obligation to those served, coupled with the need to protect the rights and preserve the dignity to individual officers, including the need to protect them from spurious allegations, that this section is formulated. The University and the Guild recognize the importance of a cooperative effort to ensure fairness to employees without unduly limiting the rights of management. A. The interview of any peace officer shall be at a reasonable hour, preferably at a time when the officer is on duty. If this is not possible, then during the normal waking hours of the employee. B. The interview shall be for a reasonable period, taking into consideration the gravity and complexity of the issue being investigated. If the interview is of extended duration, (i.e. beyond 2 hours in length), reasonable breaks will be afforded the peace officer being interviewed. C. The officer under investigation shall be informed prior to such interview of the name and assignment of the person in charge of the investigation, the interviewing person(s), and all persons to be present during the interview. D. The officer under investigation shall be informed of the nature of the investigation prior to any interview including the specific nature of the charges against him or her. E. The officer being investigated shall not be subject to verbal abuse. No promise of reward shall be made as an inducement to answer any question. F. Either the Department or the officer may request that a tape recording be made of the interview. Neither party will tape record the interview without obtaining the consent of the other party, nor shall either party attempt to secrete a tape recorder. If a tape is made the officer being interviewed is entitled to, at his or her request, a true copy of the tape. If requested, a verbatim transcript from the tape shall be provided at the officer’s expense. G. All interviews shall be limited in scope to the activities, circumstances, or events, which pertain to the employee’s conduct or acts, which may form the basis for disciplinary action. H. The officer under investigation shall be informed of the conclusions reached as a result of the investigation and of his or her rights of appeal under this Agreement. I. The University agrees to provide the employee the entire contents of the employee’s investigation file prior to the imposition of any personnel action, which could result in dismissal, demotion, suspension without pay or a reduction in pay. Upon written authorization from the employee, the University will provide the Guild a copy of the file. J. No police officer shall be compelled to submit to a polygraph examination or voice stress analyzer against his or her will. No disciplinary action or other recrimination shall be taken against an officer refusing to submit to such examination, nor shall any comment be entered anywhere in the investigator’s notes or anywhere else that the police officer refused to take such examination, nor shall any testimony or evidence be admissible at a subsequent hearing, trial, or administrative proceeding, to the effect that the employee refused to take such examination. K. Exercise of Rights: Officers shall not be discharged, disciplined, demoted, transferred, reassigned, or discriminated against with regards to employment, nor threatened with such action as a result of exercising any of the rights granted under this process or any existing administrative grievance procedure. L. The officer shall have the right to be accompanied and represented by a Guild member and/or legal counsel and shall be afforded a reasonable amount of time, normally not to exceed twenty-four (24) hours, to consult prior to an interview(s), meeting(s), conference(s), or discussion(s) that the employee reasonably feels may result in discipline. The representative will not disrupt the interview, meeting, conference, or discussion, or prevent the investigator or management representative from obtaining the employee’s truthful statements. M. The representative shall not be a person subject to the investigation or a witness in the investigation. The representative, if not an attorney shall not be required to disclose, nor be subject to any punitive action for refusing to disclose, any information received from the officer under investigation for non-criminal matters. N. No police officer shall be required or requested to disclose any item of his or her property, income, assets, source of income, debts, or personal or domestic expenditures, nor shall any officer be compelled to provide medical and/or laboratory information to investigators, unless such information is relevant to the investigation, and in the case of a criminal investigation is obtained through proper legal procedure. O. No police officer shall have his or her personal property searched without his or her consent unless pursuant to state law and with proper procedure. All university provided lockers, desks, etc., are available for search and seizure. P. Bargaining unit members have an obligation to cooperate with any investigation conducted by the University. Failure to do so will be considered insubordination and will be grounds for discipline, up to and including termination. Q. The University, at its discretion, may place bargaining unit members on paid administrative assignment during disciplinary investigations. Bargaining unit members on such paid leave shall remain available during their normal hours of work for assignments and may not engage in any other work for compensation during such hours. Paid administrative leave is not discipline and is not subject to the grievance procedure. 11.1 Definitions A grievance shall be defined as an alleged violation of a specific term or terms of this agreement or a misapplication, or a dispute regarding interpretation of the same. 11.2 The parties to this Agreement agree to use their best efforts in their attempts to settle grievances at the lowest possible level. Use of the grievance procedure shall be encouraged to obtain prompt settlement of disputes at the lowest possible level. To this end, there shall be no harassment of, or retaliation against, grievants or witnesses testifying at grievance hearings. 11.4 Step One: Within thirty (30) days of the situation causing the grievance or within thirty (30) days of when the employee should reasonably have been aware of the situation causing the grievance, the employee and/or the steward or Guild representative shall contact the employee’s immediate supervisor to set a meeting to attempt to resolve the dispute. This meeting shall occur within ten (10) days of the supervisor’s notification of the need for a meeting. The supervisor will respond within ten (10) days of the meeting. Step One shall not be available in those instances in which disciplinary action has been taken by an appointing authority. In such instances, the grievance procedure shall begin at Step Two. 11.5 Step Two: If a satisfactory settlement is not reached in Step One, the grievant or steward shall reduce the grievance to writing on the Guild’s grievance form and submit it to the Police Chief or designee for resolution within ten (10) days. The written grievance must contain specifics of the nature of the grievance including proposed resolution and the specific portions of the agreement, violated. Within ten (10) days the Police Chief, or designee, the steward and grievant shall meet to further attempt to resolve the dispute. The Police Chief, or designee, shall issue a written answer to the grievance within ten (10) days of the meeting. 11.6 Step Three: If a satisfactory settlement is not reached in Step Two, the Guild shall submit the grievance in writing along with the Step One and Step Two written responses to the Vice President for Finance & Administration or designee within ten (10) days. The Vice President for Finance & Administration, or designee, shall review the matter and respond within ten (10) days to the grievant. 11.7 Step Four Mediation: Should the Step Three response be unacceptable, the grievant’s Guild representative may submit a written request to the Public Employment Relations Commission (PERC) for mediation. The written request for mediation shall be postmarked within ten (10) days of receipt of the Step Three written response. A copy of the written request for mediation shall also be delivered to the University’s Labor Relations Officer within the same time period. If the PERC Mediator declares an impasse, the grievant’s Guild representative may request arbitration. Either party may elect to waive mediation at any time and proceed to arbitration in accordance with Article 11.8. 11.8 Step Five Arbitration: If the Guild and the University waive mediation in writing, or if the PERC Mediator declares impasse, the grievant’s Guild representative may request arbitration the grievant’s Guild representative may submit a written request to the Public Employment Relations Commission (PERC) for arbitration. The written request for arbitration shall be postmarked within twenty-one (21) days of the date of the written waiver or impasse letter. The arbitrator shall be appointed from a PERC Dispute Resolution Panel list, limited to nine Washington and Oregon arbitrators. The arbitrator shall be selected with each party alternately striking names until one remains. The arbitrator shall confine himself or herself to the precise issue(s) addressed on the grievance form and submitted for arbitration. The arbitrator shall have no authority to determine any other issue(s) not so submitted nor shall the arbitrator have any authority to add to, subtract from, or modify any provisions of this Agreement. The arbitrator’s decision shall be final and binding upon the Guild, and the University. The arbitrator’s decision shall be in writing and provided to the University and the Guild. In the event one Party substantially prevails in the arbitration, the non-prevailing Party shall bear the total cost and expense of the arbitrator. If neither Party substantially prevails, the total cost and expense of the arbitrator shall be borne equally by the Parties. Irrespective of the arbitrator’s decision, each Party, shall bear its own costs and expenses of preparing and presenting their own case including all legal/attorney fees. The grievant, the Guild representative, and their witness(es) shall not be paid by the University for preparation for, travel to or from or participation in the arbitration hearings, but may use leave for such activities. Leave need not be taken for the actual time in hearing when the hearing is held during the employees normal work shift. Under no circumstances shall a grievant, Guild representative, or their witnesses be entitled to overtime compensation for attendance at a hearing. The cost (if any) of the arbitration hearing room and/or a court reporter shall be shared equally by the Parties. Each Party is responsible for ordering and paying for their own copy of a transcript. 11.9 As used in this article, “day” shall mean calendar day. 12.1 New police policies or procedures, or revisions to existing policies or procedures, may not be implemented until after the Police Chief has reviewed, authorized their implementation and posted to the online policy manual. The official policy copy will be maintained in the online policy manual. 12.2 The Police Chief shall provide notice to the Guild of all proposed policy modifications. The Chief shall provide adequate time for input by the Guild and shall consider such input prior to adoption and implementation of the modifications. A. Interim police policies are defined as any written policy approved and signed by the Police Chief that requires or restricts any action or behavior, which, if not adhered to, could potentially subject the member to disciplinary action. B. The use of interim policies is recognized as a necessary “stopgap” measure for management to control the business of the department. C. Interim policies will be valid for thirty (30) days after the date of issue. After the thirty (30) days has expired, the interim policy shall become null and void unless it is published and included as part of Police Department Policy Manual. 1. The time lines above may be modified by mutual written agreement of the parties. C. Salary increases for the Contract period will equal to those increases observed on the General Services Salary Schedule(s) in effect throughout the 2017-2019 Contract term. A. On an employee’s periodic increment date he/she will receive a two (2) step increase within the assigned salary range until such time as he/she reaches the top step. B. All employees who have been at Step L in the same salary range for six (6) consecutive years or more will progress to Step M. The Employer may increase an employee’s step to Step M to address issues related to recruitment, retention or other business needs. 13.4 Field Training Officer For an employee who serves as a Field Training Officer (FTO), the employee will receive additional compensation of 3% of his or her monthly salary for the period assigned as an FTO. A. A bargaining unit employee who is directed by the Chief or other command personnel, to restrict off-duty activities to be immediately available for duty will receive compensation in accordance with this Article for the entire time they are required to perform standby duties. B. Employees will be assigned standby as determined by the Chief or other command personnel. C. With approval of the Chief or other command personnel employees assigned to standby status may be relieved for any portion of the assignment if a replacement is available. The person providing relief is responsible for meeting all standby obligations. A. It is recognized that some employees covered under this Agreement shall perform the duties of a supervisor. Nothing in this Agreement shall in any way interfere with carrying out their supervisory duties. In the absence of the Corporal or Sergeant, the most senior officer shall normally be the designated officer in charge and shall act as a first-line supervisor. B. A Campus Police Officer who is designated to act as Officer In Charge (OIC) in the absence of a Sergeant or Corporal for one (1) or more hours during his or her shift shall be paid an additional five percent (5%) of his or her monthly salary for the period assigned as an OIC. A. The Employer and the Guild recognize the importance of continuing education in the professional development of the employees in the bargaining unit. B. Employees in the bargaining unit may be granted time off from work without loss of pay for work-related classes as determined by the Police Chief. For non-work-related classes, the employee may request and the Chief may grant time off during the employee’s regular work period. C. It is understood that attendance at work-related and non-work-related classes during the employee’s regular work period is contingent upon sufficient staffing levels at Sergeant or Shift Supervisor and below. Such training may be canceled in the event of operational necessity. It is also understood that employees will be in uniform of the day and be available by radio in the event of recall or if the training is cancelled. Use of the patrol vehicle for transportation to and from classes shall be determined by the shift supervisor. D. Employees attending non-work-related classes during their regular work period shall be on non-pay status. Time may be made up with accumulated leave time or as prearranged by his or her supervisor. A. Each officer shall be afforded eleven (11) floating holidays per year. As used in this Article, the year will be from July 1 through June 30. The officer may use the floating holidays with the Chief’s permission, or have them paid-out during the year. Payment for any remaining holidays shall be included in the June 16-30 payroll and paid on the first payroll in July. Employees working a 4/10 work schedule who are hired or who terminate during the year shall receive pro-rata pay equal to 9.2 hours per full month of employment. Employees working a 5/8 work schedule who are hired or who terminate during the year shall receive pro-rata pay equal to 7.3 hours per full month of employment. B. During a fourteen (14) day twelve (12) hour shift work period, an employee that takes a holiday off during that work period will be charged for one (1) day of holiday leave. The maximum cash-out of floating holidays at the end of the fiscal year pursuant to Article 14.1 will not exceed ten (10) hours per unused floating holiday. C. Holidays as listed for the University shall be treated as regular days of work or rest and shall not result in additional compensation whether worked or not. There will be staffing of two (2) officers per shift on University Holidays unless more are designated by the Chief. D. In no case shall the number of holidays taken and the number of holidays paid exceed eleven (11) days per year, unless as otherwise provided in this Article. Any employee working a 4/10 work schedule who uses in excess of 9.2 hours per month of holiday time would be required to reimburse the University an amount equal to the employee’s hourly rate of pay times the number of excess hours used upon resignation, retirement, or termination. Any employee working a 5/8 work schedule who uses in excess of 7.3 hours per month of holiday time would be required to reimburse the University an amount equal to the employee’s hourly rate of pay times the number of excess hours used upon resignation, retirement, or termination. A. An employee may select one (1) workdays as personal holidays during the calendar year if the employee has been or is scheduled to be continuously employed by the University for more than four (4) months. B. An employee who is scheduled to work less than six (6) continuous months over a period covering two (2) calendar years will receive only one (1) personal holiday during this period. 2. The number of employees selecting a particular day off does not prevent the agency from providing continued public service. A. Employees are entitled to two (2) unpaid holidays per calendar year for reasons of faith or conscience or an organized activity conducted under the auspices of a religious denomination, church, or religious organization. B. An employee must give at least fourteen (14) calendar days’ written notice to the supervisor when requesting these unpaid holidays. However, the employee and supervisor may agree upon a shorter time frame. C. Employees will only be required to identify that the holiday request is for reasons of faith or conscience or an organized activity conducted under the auspices of a religious denomination, church, or religious organization. D. The holiday will be granted, unless the employees absence would impose an undue hardship on the University as defined by WAC 82-56 or the employee is necessary to maintain public safety. If an undue hardship exists, the supervisor will work with the employee to find an alternate date on which the employee can be released. A. Employees will retain and carry forward any eligible and unused vacation leave that was accrued prior to the effective date of this Agreement. 1. The employee must be employed for fifteen (15) calendar days or more during the month. 2. Any leave without pay taken during the month will not be counted toward the qualifying fifteen (15) calendar days. 3. Holidays for which the employee is otherwise eligible that fall within the qualifying fifteen (15) days count toward the minimum requirement. 4. Vacation leave accrual for other than full-time employees will be computed and accrued in an amount proportionate to the time the employee is in pay status during the month to that required for full-time employment. Employees may use vacation leave for care of family members as required by the Family Care Act, RCW 49.12, and WAC 296-130. Should the Employer be required to cancel scheduled vacation leave because of an emergency, affected employees may select new vacation leave from available dates. to the maximum. If the agency grants an exception, the employee’s vacation leave maximum will be extended for each month that the Employer must defer the employee’s request for vacation leave. 2. An employee may also accumulate vacation leave days in excess of two hundred forty (240) hours as long as the employee uses the excess balance prior to his or her anniversary date. Any leave in excess of the maximum that is not deferred in advance of its accrual as described above, will be lost on the employee’s anniversary date. Any employee, who resigns with adequate notice, retires, is laid-off, or is terminated by the Employer, will be entitled to payment for vacation leave credits. In addition, the estate of a deceased employee will be entitled to payment for vacation leave credits. 15.2 Sick Leave The University will administer and provide sick leave for all employees covered by this Agreement on the same basis as the program is provided for all other University employees, except as otherwise provided for in this Article. 1. Full-time employees will accrue eight (8) hours of sick leave per month, if the employee is on an eight (8) hour shift. Employees will accrue ten (10) hours of sick leave per month if the employee is on a ten (10) hour shift. Employees will accrue twelve (12) hours of sick leave per month if the employee is on a twelve (12) hour shift. 1. A personal illness, injury or medical disability that prevents the employee from performing his or her job, or personal medical or dental appointments. 2. Care of family members as required by the Family Care Act, RCW 49.12, WAC 296-130, including care of a family member for illness, injury, and medical or dental appointments. 3. A death of any relative that requires the employee’s absence from work. Sick leave used for bereavement is limited to five (5) days per occurrence. Relatives are defined for this purpose as spouse, significant other, son, daughter, grandchild, foster child, son-in-law, daughter-in-law, grandparent, parent, brother, sister, aunt, uncle, niece, nephew, first cousin, brother-in-law, sister-in-law and corresponding relatives of employee’s spouse or significant other. 4. Qualified Absence under the Family Medical Leave Act. 5. Exposure of the employee to a contagious disease when attendance at work would jeopardize the health of others. The supervisor may require a written medical certificate. The Employer may allow an employee who has used all of his or her sick leave to use compensatory time or vacation leave for sick leave purposes. In the event an employee is injured or becomes ill while on vacation leave, the employee may submit a written request to use sick leave and have the equivalent amount of vacation leave restored. The supervisor may require a written medical certificate. An employee must promptly notify his or her supervisor on the first day of sick leave and each day after, unless there is mutual agreement to do otherwise. If the employee is in a position where a relief replacement is necessary, the employee will notify his or her supervisor at least two (2) hours prior to his or her scheduled time to report to work. If the employer suspects abuse, the Employer may require a written medical certificate for that sick leave absence. An employee returning to work after any sick leave absence may be required to provide written certification from his or her health care provider that the employee is able to return to work and perform the essential functions of the job with or without reasonable accommodation. 3. They notify their payroll office by January 31st that they would like to convert their sick leave hours earned during the previous calendar year, minus any sick leave hours used during the previous year, to cash. All converted hours will be deducted from the employee’s sick leave balance. At the time of retirement as defined by the Department of Retirement Systems regulations and/or state laws relating to retirement, from state service or at death, an eligible employee or the employee’s estate will receive cash for his or her total sick leave balance on a one (1) hour for four (4) hour basis. For the purposes of this Section, retirement will not include “vested out of service” employees who leave funds on deposit with the retirement system. In accordance with state and federal law, agencies and employees in bargaining units may agree to form Voluntary Employee Beneficiary Associations (tax-free medical spending accounts) funded by the retiree sick leave cash out described above. Former University employees who are re-employed within three (3) years of leaving state service will be granted all unused sick leave credits they had at separation. 15.3 Shared Leave The University will administer and provide shared leave for all employees covered by this Agreement on the same basis as the program is provided for all other University employees, except as otherwise provided for in this Article. 1. An employee may receive shared leave if he/she is likely to take leave without pay (LWOP) or terminate employment due to an extraordinary or severe illness, injury, impairment, or physical or mental condition which causes the employee to be unable to work. 2. Any illness, injury, or impairment which has caused or will likely cause hospitalization or alternative extended treatment or care is considered serious enough to qualify the employee for shared leave. 3. An employee who is likely to take LWOP or terminate employment because he or she has a relative or household member suffering from such a condition may apply to receive shared leave. 4. An employee who has been called to serve in the uniform services. 1. An employee who does not accrue sick leave. 2. An employee for whom time loss compensation from the State Department of Labor and Industries has been allowed. An employee must use all accrued sick leave and annual leave before being eligible to use shared leave. An employee is not required to completely deplete their accrued leave balances to apply for shared leave. An employee requesting shared leave due to being called to serve in the armed services need only deplete their annual leave and paid military leave before taking shared leave. An employee may receive up to 90 days (522 hours) per event, with a total of 261 days (2088 hours) of shared leave over his or her entire career of state employment. 2. If the employee is incapacitated or is unavailable due to a call to service in the uniformed services, the employee’s representative may complete and submit the documentation. 1. An employee who accrues annual leave and/or sick leave and/or personal holidays may donate a minimum of one hour to an approved shared leave recipient. 2. All donations of leave must be to a specific person. 3. The donor completes and submits a Donation of Shared Leave Hours form. 4. The donor also submits a copy of their most recent Time/Leave Report. 5. Employees voluntarily elect to donate leave and do so with the understanding that donated leave will not be returned, except for any portion not used by the recipient under Section 15.3.L of this Article. 1. The donor must retain an annual leave balance of at least 80 hours at the time the donation is processed. 2. An employee may not donate annual leave hours that would otherwise be lost on the next anniversary date. 3. Minimum annual leave balances are pro-rated for employees working less than full time based upon the percent of the FTE. The donor employee must retain a minimum of one hundred seventy-six (176) hours of sick leave after the transfer. Shared leave may be used in accordance with a doctor’s statement outlining a return to work program. Shared leave may be used until exhausted or the employee returns to a full time work schedule whichever occurs first. 1. Employees using shared leave will be considered in active pay status and will receive the same treatment in respect to salary, wages, and employee benefits as the employee would normally receive if using annual leave or sick leave. 2. The receiving employee will be paid his or her regular rate of pay; therefore, the value of one hour of donated shared leave may cover more or less than one hour of the recipient’s salary. 3. The University will respect an employee’s right to privacy. However, upon approval for shared leave, and if the employee so requests, the University will inform the University community of the employee’s eligibility for shared leave. 4. Human Resource Services will notify the requesting employee in writing of the decision to approve or deny shared leave including the process for appeal. If an employee disagrees with the decision, that employee may appeal the decision to the Chief Human Resource Officer. 1. Any shared leave not used by the recipient will be returned to the donor(s). 2. The remaining shared leave is to be divided on a pro rata basis among the donors and reinstated to the respective donors’ appropriate leave balances based upon each employee’s current salary rate at the time of the reversion. The shared leave returned will be prorated back based on the donor’s original donation. An employee who is a member of the National Guard, or reserve component of the Armed Forces of the United States is entitled to paid leave not to exceed twenty-one (21) work days in any training year for active duty training. Such leave shall be granted without loss of pay or other leave and without impairment of other rights or benefits. 3. For life-giving procedures, when approved in advance. Employees will receive paid leave and be allowed to retain any compensation paid to them for their jury duty service. Employees will promptly inform the Employer when notified of his or her jury duty summons. If selected to be on a jury, employee-requested schedule changes will be approved, to accommodate jury duty service. If employees are released from jury duty and there are more than two (2) hours remaining on their work shift, they may be required to return to work. 1. An employee is entitled to three (3) days of paid bereavement leave if his or her family member or household member dies. An employee may request less than three (3) days of bereavement leave. 2. The Employer may require verification of the family member’s or household member’s death. 3. In addition to paid bereavement leave, the Employer may approve an employee’s request to use compensatory time, sick leave, vacation leave, exchange time, his or her personal holiday or leave without pay for purposes of bereavement and in accordance with this Agreement. 4. For purposes of this sub-article a family member is defined as parent, sister, brother, parent-in-law, spouse, grandparent, grandchild, and child. A household member is defined as persons who reside in the same home who have reciprocal duties to and do provide financial support for one another. This term does not include persons sharing the same house when the living style is primarily that of a dormitory or commune. When approved, employees will receive paid leave, not to exceed five (5) working days in a two (2) year period, for participating in life-giving procedures. “Life-giving procedure” is defined as a medically-supervised procedure involving the testing, sampling, or donation of blood, platelets, organs, fluids, tissues, and other human body components for the purposes of donation, without compensation, to a person or organization for medically necessary treatments. Employees will provide reasonable advance notice and written proof from an accredited medical institution, physician or other medical professional that the employee participated in a life-giving procedure. The Employer may take into account program and staffing replacement requirements in the scheduling of leave for life giving procedures. Employees returning from authorized leave without pay may be employed in the same position or if the leave is for more than three months, in another position in the same job classification as determined by the Chief, provided there is an open position available. If there is no open position available, the layoff provisions of this Agreement shall apply. In addition to the twenty one (21) work days of paid leave granted to employees for active duty or active duty training, unpaid military leave will be granted in accordance with RCW 38.40.060 and applicable federal law. Employees on military leave will be reinstated as provided in RCW 73.16 and applicable federal law. In addition to the twenty one (21) work days, employees called to active military duty will continue to accrue seniority within the state system. Employees may be allowed to utilize accrued sick leave or vacation leave to provide for an extension of Health & Welfare benefits for up to one (1) year when on leave without pay due to an illness or injury. 15.7 Light Duty The Employer may require employees receiving workers compensation time-loss payments to work light duty, consistent with RCW 41.04.520 or as amended and other applicable laws. If an employee is unable to perform this light duty assignment by reason of an illness or injury unrelated to the duty disability injury or condition, the employee may use acquired sick leave. 15.8 Should Washington Administrative Code (WAC) 357-31 yield higher leave benefits, applicable to WSU civil service employees, than noted in this Article, the University will follow the applicable WAC for employees covered by this Agreement. 16.1 The Employer will not contract out work which results in the layoff of bargaining unit employees prior to complying the provisions of RCW 41.06.142. 16.2 The Employer will make a good faith effort to provide bargaining unit members the first. 17.1 This Agreement shall be effective on July 1, 2017, and shall remain in full force and effect until June 30, 2019. 17.2 During the life of the Agreement, portions, Articles, or sections of this Agreement may be opened by mutual consent of the Guild and the University without affecting any other portion, Article, or section of this Agreement. In the event the parties fail to agree on new language, the existing language prevails. This section does not apply in those instances where existing language was found unlawful and the parties were required to re-negotiate new language as a substitute for the invalidated Articles, section or portion thereof. 17.3 All terms of the Agreement shall remain in full force and effect during subsequent periods of negotiation, subject to the requirements of RCW 41.80. 17.4 Bargaining shall commence for a successor agreement under RCW 41.80 no later than June 1, 2018, unless mutually agreed upon by the parties. Perform general duty police work to protect life and property; general investigative work, enforce laws and ordinances, maintain order, and prevent and investigate crime. One (1) year of police experience. Perform general duty police work and lead other police officers performing general duty police work to protect life and property; general investigative work, to enforce laws and ordinances, maintain order, and prevent and investigate crime. Positions allocated to this class perform patrol duties of the police officer and are responsible for regularly directing police officers when serving as the senior officer on duty or when otherwise required. Incumbents are required to obtain certification or complete a basic law enforcement course as approved by the Washington Law Enforcement Officer’s Training Commission. Incumbents have arrest powers and are required to be commissioned law officers under regulations of the State. Positions may perform and/or lead officers performing specialized assignments/duties to include but not limited to: Community Oriented Policing (COP), education, prevention, and enforcement activities on targeted geographic and demographic areas or investigation of illegal or criminal activities as a principal duty. Assist city or county police and state patrol in cases of emergency; Perform related duties as required. High School graduation or equivalent; twenty-one years of age; possession of a valid driver’s license; no previous felony convictions; U.S. citizenship. Two (2) years of police experience which has included six (6) months of experience as a Campus Police Officer. College level training may be substituted, year-for-year, for up to one and one-half (1 ½) years of the required experience. Equivalent education/experience will substitute for all minimum qualifications except when there are legal requirements, such as a license/certification/registration. First-level supervision training is preferred. Supervise a squad or shift of full-time campus police or security personnel or oversee the administration of an operation(s) or project(s), performing general duty police work to protect life and property; general investigative work, to enforce laws and ordinances, maintain order, and prevent and investigate crime. Positions allocated to this class perform patrol duties of the police officer, and are responsible for supervising a group of police officers or other security staff or oversee the administration of an operation(s) or project(s). Incumbents have arrest powers and are required to be commissioned law officers under the regulations of the state. Positions may perform and/or supervise officers performing specialized assignments/duties to include but not limited to: Community Oriented Policing (COP), education, prevention, and enforcement activities on targeted geographic and demographic areas or investigation of illegal or criminal activities as a principal duty. High School graduation or equivalent; twenty-one years of age; possession of a valid driver’s license; no previous felony convictions; U.S. citizenship. Two (2) years of work experience as a Campus Police Officer. A Bachelor’s Degree may substitute for one (1) year of required experience.